Barton Rovers gave themselves a real chance of making the play-offs this season with a battling victory over Hanwell Town at the weekend. The visitors almost took the lead on three minutes when Lucas Perry thundered down the wing beating four players to find Ben Sawyer on the edge of the Hanwell box. His shot was dropped by the home keeper and fell to Connor Vincent, although he shot inches wide. Rovers were completely dominant, but on 18 minute a rare mistake at the back gifted Hanwell a penalty that Michael Buckley converted. 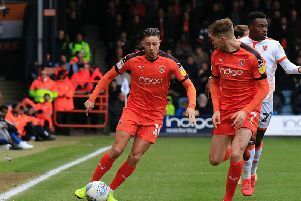 Within seven minutes Rovers were level though as a fantastic move saw Sawyer twist and turn the defence to fire an excellent left-footed shot in the net. After the break, Hanwell retook the lead through Ian Bywater on 55 minutes after another mix-up in Barton’s defence. Rovers had two penalty shouts turned down, one for a foul on Rhys Hoenes and the other handball. Barton made a double substitution with 20 minutes to play as Russell Bull and Tuki Tayali came on, with Bull netting a fine equaliser, showing great strength to nod home Sawyer’s cross. Bull wasn’t finished there either as moments later he climbed highest to reach Alex Condon’s free kick and head home the winner. Joint Manager Wes Byrne said: “It wasn’t our best performance of the season but the lads dug in and we went for the win. Results elsewhere mean Rovers climbed up to fourth in the league and travel to Aylesbury Utd this weekend, knowing victory would assure them a play-off place.